The artist’s name that did this Rich Woodall and he knocked it out of the park! I can’t even tell you how amazed I was when I came back to his table and he presented me with this! Let me know what you guys think – I had a blast this year and I can’t wait for next year! I told you about my great experience with Trimpe – and now onto another great couple of guys – Matt Fletcher and Chris Uminga! Both of these guys have such unique styles it’s hard to imagine getting a piece from them and not being impressed! 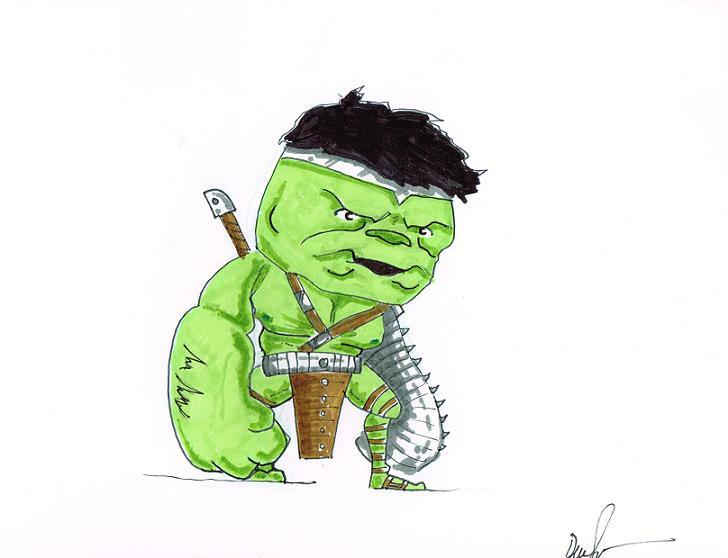 So far, to date, I have a Planet Hulk bust, another Planet Hulk piece on a 5×17 (both are posted on the ART page) but I never had a classic Hulk done – so this was the year! 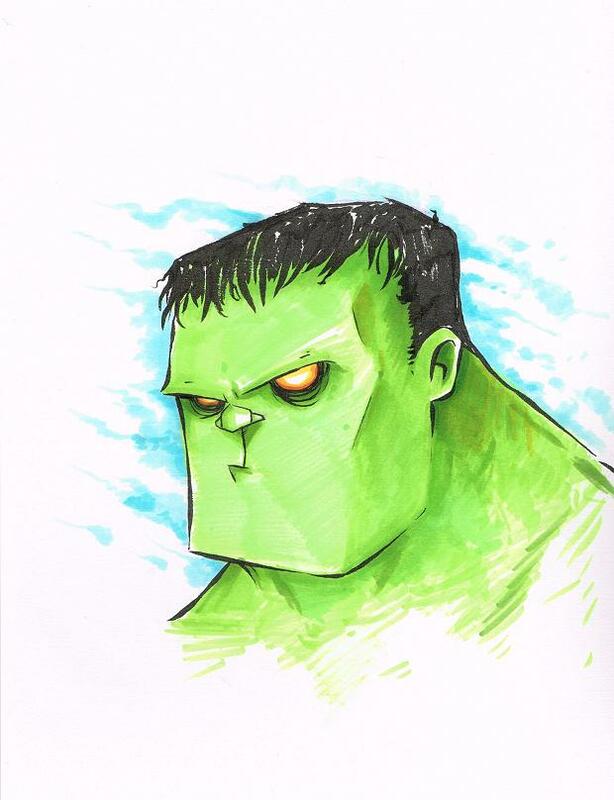 With Matt – whose style is fantastically unique (how these guys don’t have a regular gig at one of the big two is beyond me) gave me a classic Hulk last year – and this year I asked for Fixit. He knocked it out of the park! Right down to the pin stripes and fedora! 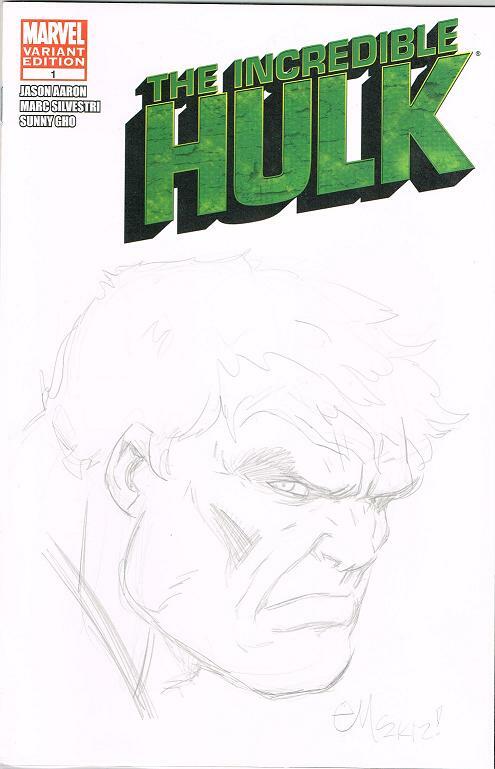 I know some of you guys remember the amazing Hulk commission that Tim Sale did for me – it’s still one of my favorites – and he was at the BCC once again. I would have loved to get something from him – but Sale’s prices jumped considerably this year. I can’t say I blame Sale for raising them – if you look on ebay you’d see that his art usually sells for well over what he’s charging. No, it’s more the flippers I blame. People who go to cons looking to get cheap art specifically to turn around and put on ebay for a profit. Most of these guys are unscrupulous too – using excuses and reasons like “I’m getting it for my kid” that takes time and pieces away from actual fans and collectors. I also sort of blame the people who pay outrageous amounts for art like this. Either way – I can’t blame Sale for raising his prices – especially since he’s such a nice guy. He’s a real decent fellow who seems to enjoy talking to the fans. He also puts more effort and time into his now more expensive fast passes. Of course, he priced himself out of what I am willing to pay for pieces so… I moved on. 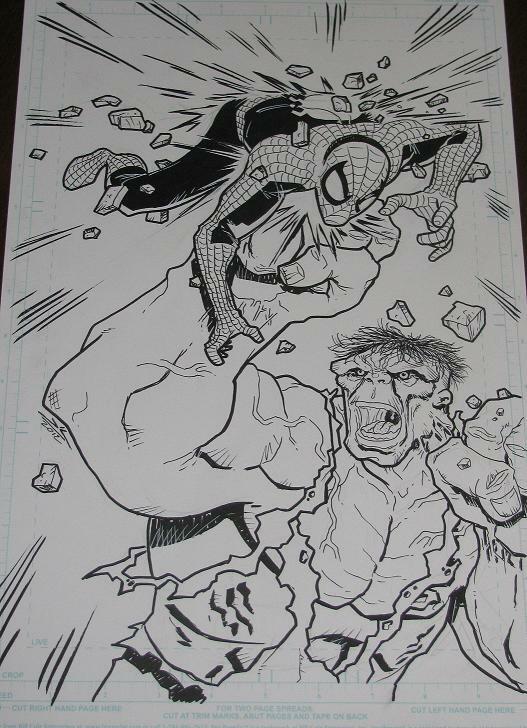 The pieces you see were done by Bryn Cimino who is the daughter of another Hulk fanatic and friend John Cimino of Hero Envy She was doing them for just $1 and I think they are fantastic! 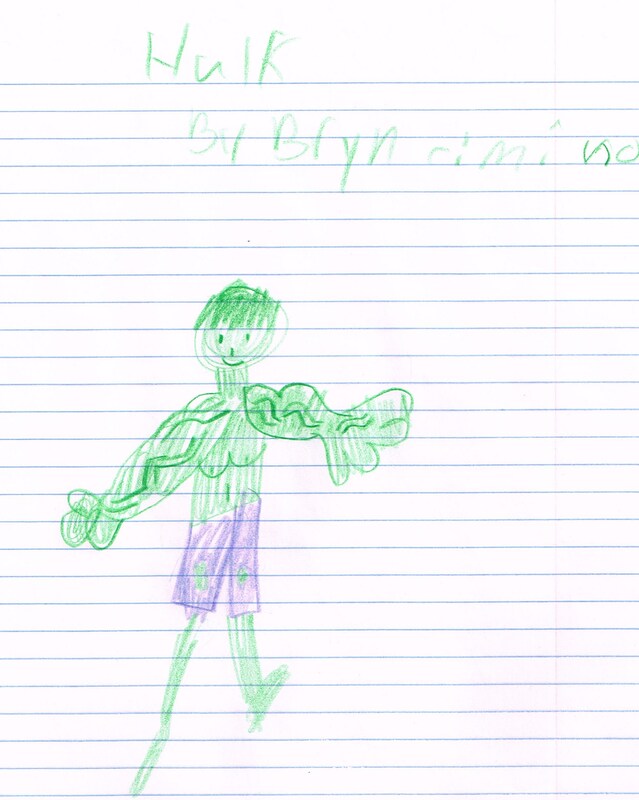 Wolvie's got Hulk on the brain! Classic cover by a classic artist! 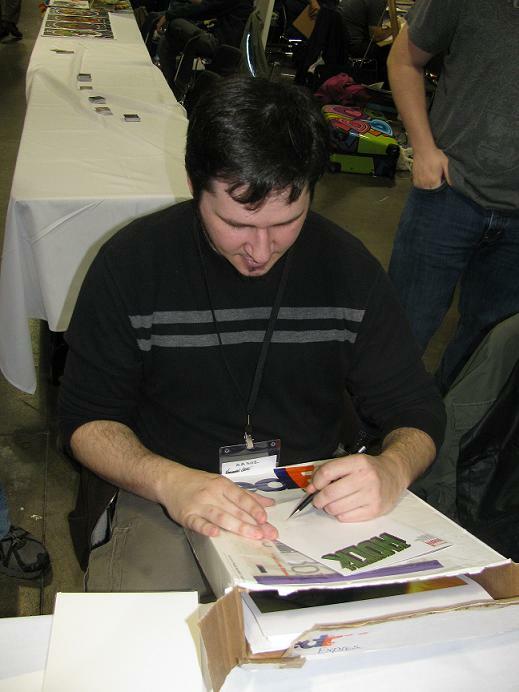 THIS is how to get a comic signed people! 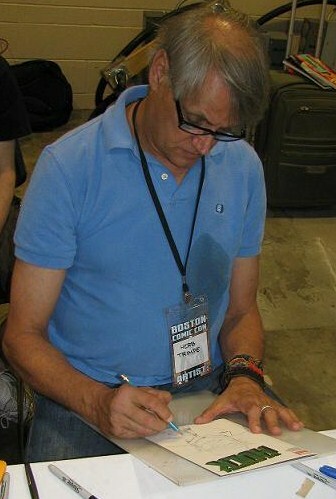 And lastly, for the day, a shot of Trimpe working on my cover. I like to think I can get an artist excited about doing a project – something that they haven’t done before. 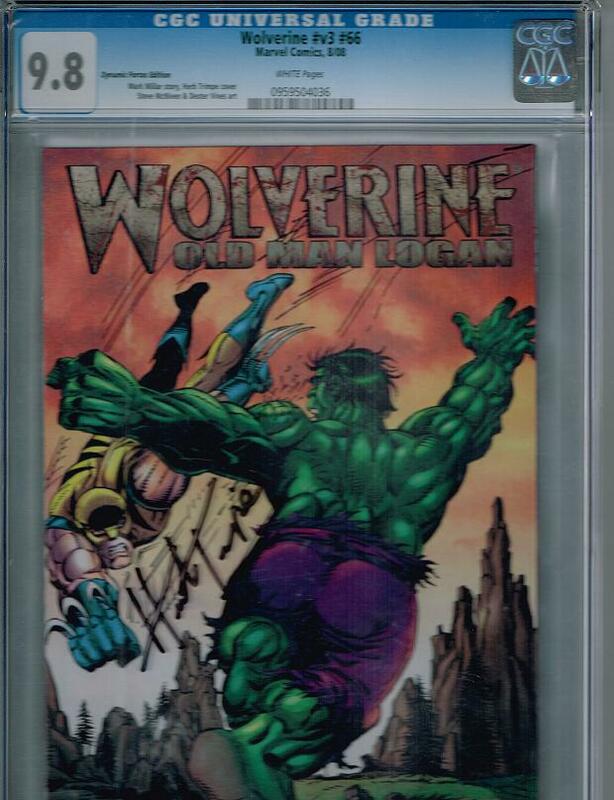 I am sure that Trimpe gets so many requests for a Hulk and original Wolverine that he may just be happy getting a new request once in a while too. I know Fixit isn’t a huge stretch – but at least it’s somewhat different. 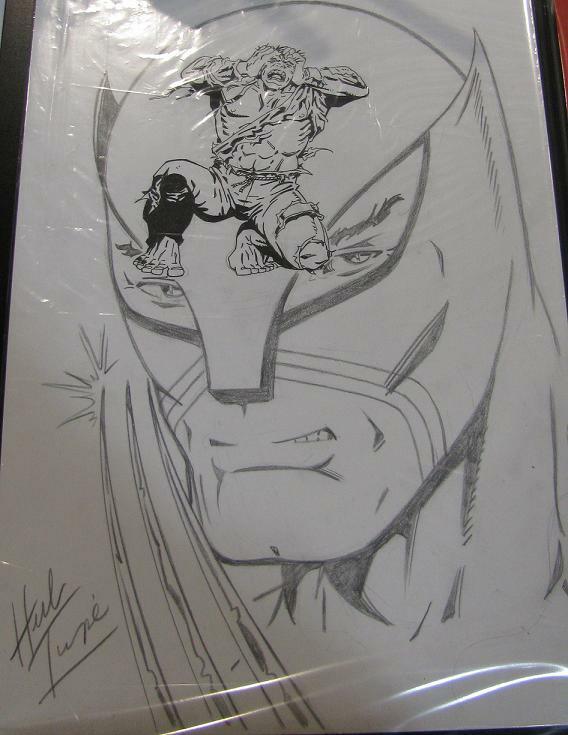 Boston Comic Con – 2012! 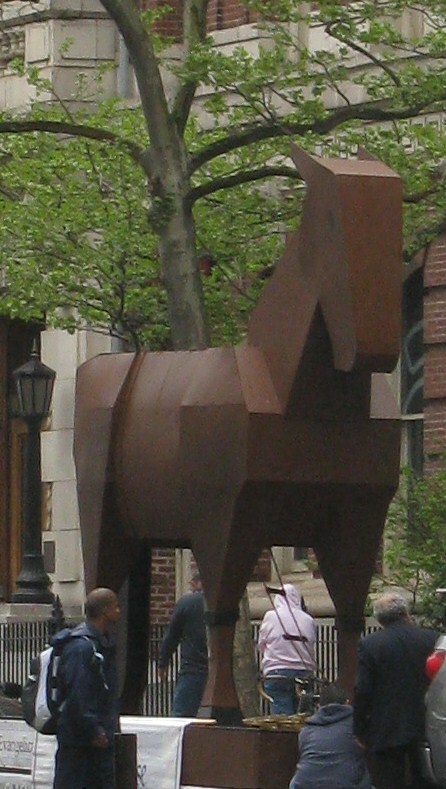 A trojan horse out side of the con? You know it will be a good day when this is the first thing you see! Let me say something quickly before I begin, sometimes I really have to remind myself that this blog is a hobby – one that I love – but a hobby none the less. So, you’ll forgive me if I don’t want to come onto my site and have an argument that goes in circles. I blogged about how the Red Hulk comic doesn’t sell like it should and it turned into a back and forth with someone who couldn’t get over a simple fact. But here’s the thing – and here’s a note to everyone out there – this is supposed to be fun – those arguments aren’t fun, they are just plain annoying. So if you want to come to argue, don’t. For two reasons – #1) I can and will delete or edit your posts – without giving it a second thought. #2) I don’t care enough to let your opinions be heard. Sorry if that sounds harsh – but I didn’t create this site and put all the time and effort into making it a fun and informative resource just for people to come here and spout off. If you are really that intent on making a point – start your own blog and go at it. It’s easy enough to do – I’ll even help you. Now that’s not to say you can’t say something if you don’t agree with me – if you want to state something and it conflicts with my views – go for it. Just be respectful. Consider it like coming into someone’s house. Just have enough class not to come in and insult the host. I know people have had a problem with Logan’s posts sometimes – but if you go back and look at his comments you’d see he doesn’t get personal – he has a definite opinion on things – but he makes his point and doesn’t call people fan boys or any other names. Great – you can keep on posting. But if you come on here and call me a fan boy and treat me as such you can sure you won’t last long posting. It’s no skin off my nose if you don’t come back. Believe it or not – I don’t do this site for the traffic. I could care less if people come here to check out the collection – but they do and I like talking to most of them. But I am not so dependant on comments that I will just anyone come on here to say whatever they want. Huge line? Yup - huge line. 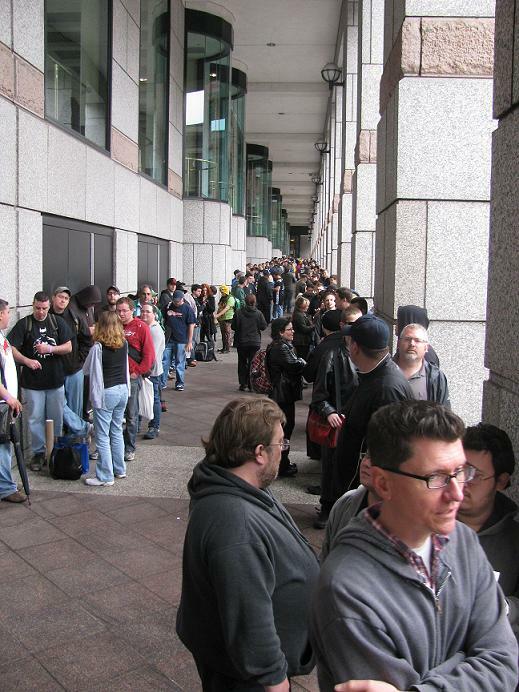 Sorry about the long rant – this is supposed to be about the Boston Comic Con. Yes, I went – yes, I had a blast – and yes I have a ton more art to show off. 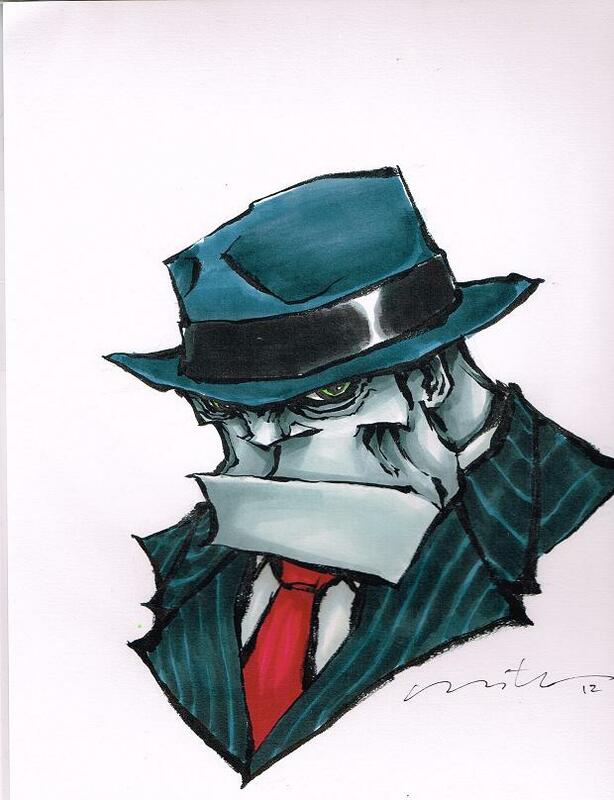 I am thinking I need to start off with saying I was looking/hoping for a McGuinness sketch – a Trimpe sketch and to re-create a couple of covers with some affordable artists. Did I get everything I was hoping for? 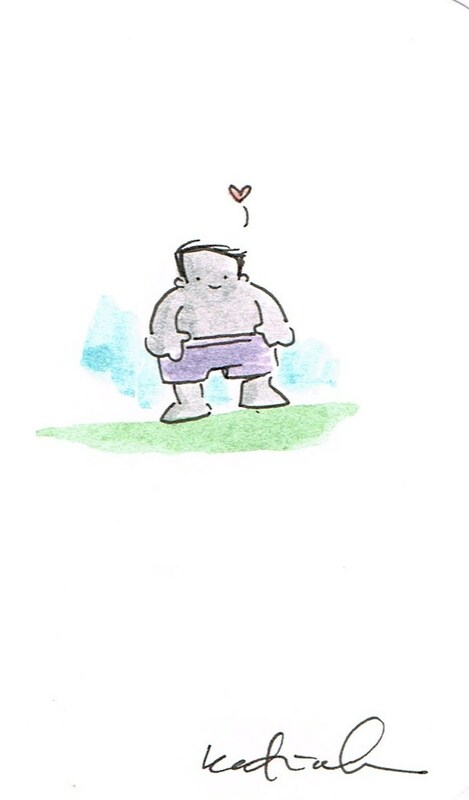 And my specially made Grey Hulk - thank you Katie! I was off to what I considered a great start! 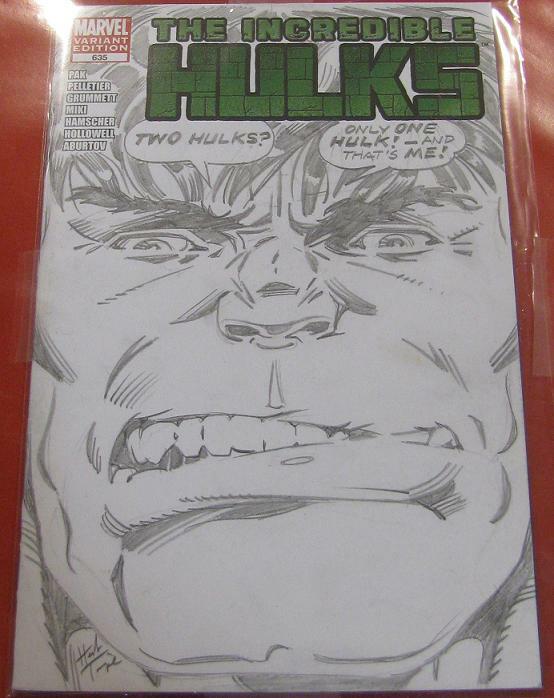 I needed to find Trimpe’s table though – as last time he was at the BCC he had a considerable line! Come on back tomorrow (if you want) as the story gets better (with no rant in the beginning) with a whole lot more art to show! 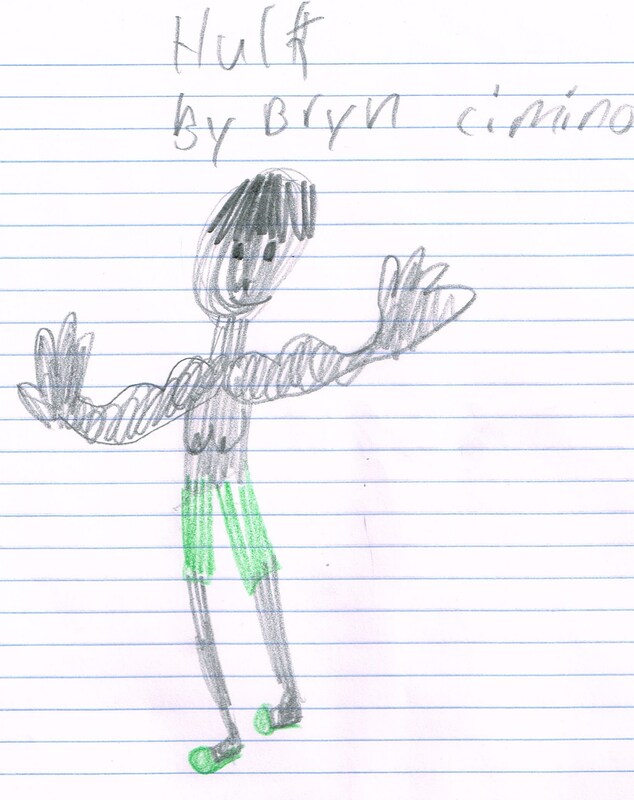 I will be posting my review of Hulk #7 soon – but in the meantime… enjoy the latest installment. How and WHY is it Possible? Looking at the monthly sales it seems TIH is continuing to lose readers – it’s down to about 40,000 – and the better book, The Red Hulk, is staying at a measly 21,000. What is it with comic readers not buying the well written series? 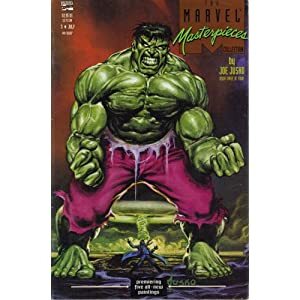 When the Red Hulk was a sales juggernaut it was one of the worst written series that had come out in a long time – now that the book actually makes sense and is a decent read – more than 70% of the readers disappeared. What does that say about comic readers? I’ve heard people complain that they want genuine, better stories and stop with the big events – yet, looking at the monthly sales, that’s all that people keep buying. It’s somewhat disappointing. Not to mention – why is TIH still at $3.99? The FF book – that only had 200 less readers in February – was $2.99! The following month – the FF was back at $3.99! Is Marvel just going month by month here? 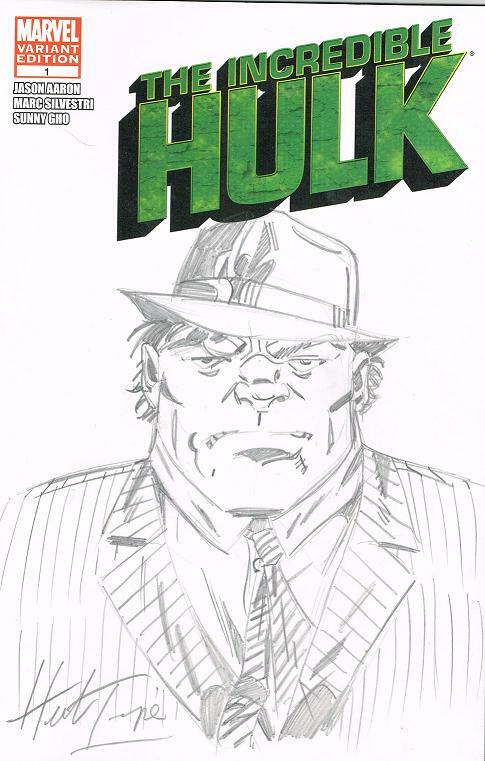 I told you I saw in NJ this past weekend – and I saw plenty of Hulk #50 – and I mean PLENTY – still sitting on the shelves of the comic shop I was in. When I asked about it – they said that Hulk does not sell anymore. It’s too bad. I was in Jersey this past weekend – and I don’t mean it like “Ewww… I had to go to Jersey” I mean it like “Yay! 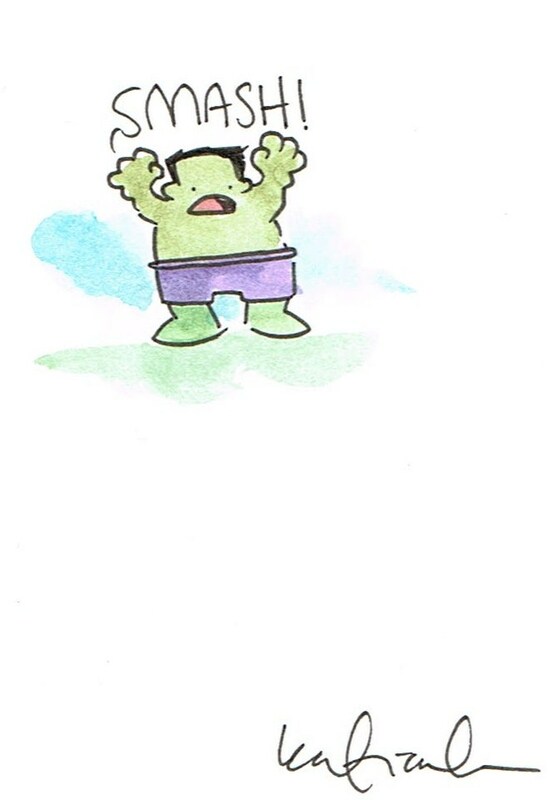 I was in Jersey!” and Corry (from Zapp Comics in Wayne, NJ) had the honor of taping a quick Hulk video – click on the image to see it!